Emerald ash borer (EAB; Agrilus planipennis, Coleoptera: Buprestidae) causes large economic costs by killing ash trees (Fraxinus spp. ): a process that takes several years of infestation. We suggest that the most important prediction regarding this species is not whether EAB can persist indefinitely in a new region, but whether it can persist long enough to kill trees. We use a mechanistic model of overwintering mortality of EAB prepupae to identify Canadian cities and more generally, those areas of North America at risk of impact. Although we have previously used a Newtonian cooling model to predict underbark temperatures of ash from meteorological data, we show that a linear regression model has smaller errors for the low winter temperatures relevant to EAB mortality. Using this regression model we generate distributions of predicted underbark temperatures which we then use to predict the return time of weather events cold enough to cause either complete (99%) or partial (75%) mortality of overwintering EAB prepupae. We find that most of North America does not experience extreme cold events frequently enough to prevent ash mortality from EAB (i.e., more frequently than every 6 years), and therefore conclude that large economic impacts are likely throughout the continent. However, if relatively frequent partial mortality events are sufficient to reduce ash mortality, there is a possibility of northern refugia for ash species, and some northern Canadian sites may escape the costs of this non-native pest. Funding for this study was obtained through an NSERC (Natural Sciences and Engineering Research Council of Canada) Strategic Grant to Kim Cuddington and Brent Sinclair. Our thanks go to the Canadian Food Inspection Agency, the Canadian Forest Service, the London Psychiatric Hospital and the Sarnia Golf and Curling Club for access to field sites for sampling EAB and helpful advice. Experimental work was conducted in the Biotron Centre for Experimental Climate Change Research at the University of Western Ontario using CFI (Canadian Foundation for Innovation) funded equipment. We also acknowledge David (Xinyang) Bing, Joshua Farhi and Greg Watkinson for their assistance with EAB sampling and lab work. We are further grateful to Joan Costello, Lori Costello, Diane Tregunna and the North Bay Jail, Josef Ric, Alex Bykov and the City of Toronto foresters, Rick Knapton and the Cataraqui Region Conservation Authority, Eugene Conners and the City of Kingston, Jason Pollard and the City of Ottawa, as well as Chris Saunders, Mark Wartenbe, Mike Jenkins and the City of Edmonton for granting access to field sites and ongoing support, provision of time, manpower and equipment for installing and maintaining data loggers in ash trees. Air temperature maps of North America were obtained from Dan McKenney at Natural Resources Canada. The support of Dan and his staff was invaluable in completing this work. We used gridded daily extreme winter minimum data for Canada as the input to the best fit Newtonian cooling model (daily data from this source was not available for all of North America) to predict the probability of EAB mortality events. The Newtonian cooling model based on daily minimum temperatures predicted more frequent complete mortality events (99% mortality) in Canada than the linear regression model, and consequently a smaller area of economic risk. The Newtonian model predicted some small areas inside the native range of ash in Canada that would experience complete mortality every 1–3 years (Fig. 8). However, the area predicted for frequent complete mortality events excluded most Canadian urban centers. Therefore we interpret this model as predicting the potential for a small northern refuge for ash, but large economic impact for many Canadian cities. Of course, for 75% mortality events, a Newtonian cooling model predicts a much larger potential refuge for ash. 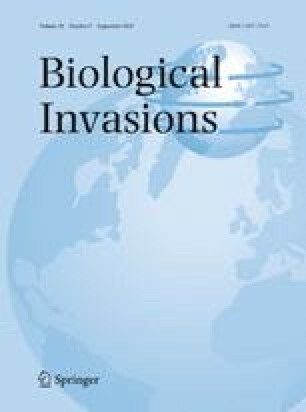 This prediction suggests that that northern cities such as Edmonton and Saskatoon might escape significant economic impact of this invasive pest.